FAQ-How to use a perforation gauge? In our last article we discussed what perforations are. If you remember, perforations are the tiny punched out holes that permit us to tear our stamps from a stamp sheet. Sometimes, two stamps may seem identical, but actually have a different perforation measure. This can mean that one of the stamps is more rare than the other and worth more money. 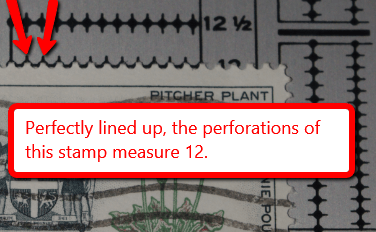 So how do you measure the perforation of a stamp? First of all, you absolutely need a perforation gauge. This handy and inexpensive little tool will enable you to measure your stamps effectively and relatively simply. There is a little skill involved, but with some practice you’ll be a pro in no time. What is a perforation measure? A perforation measure is the measure of the amount of perforation holes in a 2 cm space. I suppose you can measure 2 cm with a regular ruler and then count out the holes, but it is so much easier to use a perf gauge. You see, a perf gauge has a whole series of perf measures printed on it and you simply have to compare your stamp to the preprinted measures until they match perfectly. How do I use a perforation gauge? 1) Make sure you have enough light, perforation holes are small and the difference between two measures can be slight, so a lot of light is necessary. 2) If your perf gauge is transparent it can be handy to place your perf gauge on an evenly coloured surface; I like to use a manilla envelope or a piece of cardboard. If you have a metal gauge, it will automatically provide an even background. 3) with the kind of perf gauge pictured above, slide your stamp up or down the perf gauge until all of the perfs fit in-between the black lines perfectly. Depending on the colour of your stamp, you may find it a good idea to turn your stamp over onto its gummed side while you measure, that way you won’t be distracted by your stamp’s design and colours. The numerical value of the perf measure will usually be located beside the row of black dots. Voilà! Sometimes, perf measures can get a little complicated. For example, Unitrade #593A has a vertical perf measure of 13.3 (yikes!). Most perf gauges only go up to the nearest ½, so stamps that have a 0.3 or 0.6 measure can be a little difficult to figure out. You can only do your best! You can also double check your results against the measures provided in the Unitrade catalogue. Remember, some stamps have one perf measure for their horizontal sides and a different one for their vertical sides. So, it can be a good idea to measure both sides.